New Hyundais on the way | What Car? Hyundai has confirmed a range of new or updated models. There's good news for coupe buyers, too. Hyundai has said that the Genesis is likely to be sold in the UK. The rear-wheel drive coupe is already on sale in the US, and sources at Hyundai have told us that a UK version is now likely because the car is to be engineered for other right-hand drive for markets, such as Australia. A turbocharged 207bhp 2.0-litre four-cylinder petrol engine and a 302bhp 3.8-litre V6 are available in the US but, despite the 2.0-litre being cheaper to run, Hyundai is more likely to bring the V6 engine to the UK. The V6 would make the Genesis Coupe more appealing to the niche market that Hyundai expects it to attract and make it a more obvious rival to Nissan's 370Z. The Genesis Coupe is expected to go on sale toward the end of 2010, with prices starting at around 25,000. 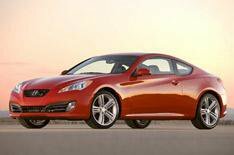 Although the Genesis Coupe should represent value for money, Hyundai will launch another, cheaper, front-wheel drive coupe in 2011. The new model is expected to closely resemble the Veloster Coupe concept car that was unveiled in 2007, and will be based on the i30. Hyundai says that it will have a Mini Clubman-style rear-hinged 'suicide' door on one side, which will be switched over for right-hand drive versions to avoid it being opened into oncoming traffic. A new 150bhp 1.6 petrol will be among the engines available with the option of Hyundai's Idle Stop and Go (ISG) engine stop-start system. Hyundai has also confirmed that a face-lifted version of the Santa Fe SUV will go on sale in November. As well as some mild interior and exterior tweaks, it'll get a new 173bhp 2.0 diesel with an optional six-speed automatic gearbox. The revised model will also use an updated version of the current 2.2-litre diesel engine. Power will increase from 153- to 190bhp, but CO2 emissions are expected to be reduced from 191g/km to less than 180g/km. An updated version of the i10 city car is due at the end of 2010, but a makeover for the i30 small hatch may be put back. It will receive engine and interior upgrades in 2010, but Hyundai is likely to leave the exterior alone and instead concentrate on producing an all-new model. Plans for an all-new 'D segment' car, to rival the Ford Mondeo and Vauxhall Insignia, are going ahead. Hyundai's designers say that the all-new model 'will sell on its looks'. The estate version is due to be launched first, and Hyundai promises 'very low' CO2 emissions.